Hi foodies! Are you craving for something hot to make you feel better this cold season? 1 1/2 cups soup stock (the water I used to cook the squash). Melt the margarine (I used Star Margarine) and saute the onion. Add in salt and pepper, cook until the onion is brownish. Stir in the cooked squash and the vegetable stock. Let it boil, reduce heat, and simmer for at least 45 minutes on low to medium heat. Instead of parsley, I added Malunggay leaves to make my soup even more nutritious. 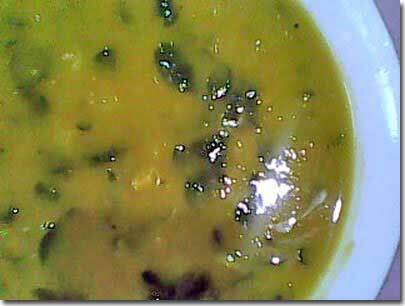 This entry was posted in Comfort Food and tagged comfort food, creamy hot soup, squash soup, squash soup with malunggay leaves on January 22, 2011 by Yami. Lam mo sis miss ko na ang malunggay! Followed this one na din sis. By the way i’m promoting by second blog, kindly check it HERE thanks a lot. I’m not a fan of squash, but I would take your recommendations. 🙂 hope I can find malunggay leaves here, na-miss ko tuloy..
wow, that was simple and looks delicious 😉 thanks for sharing, will try to cook this one weekend! This is such a healthy dish! Perfect to pair with fried fish. Hopping here from the Bloggers Exchange. Hi, adgitizing here, I’m a soup person, would love to try this recipe, looks delish! Miss ko na rin ang Malunggay! Visiting thru The Bloggers Exchange and please update your badge link to our Official Blog Site, Thanks! Following and visiting through TBE. yummylicious soup! will try this one soon.